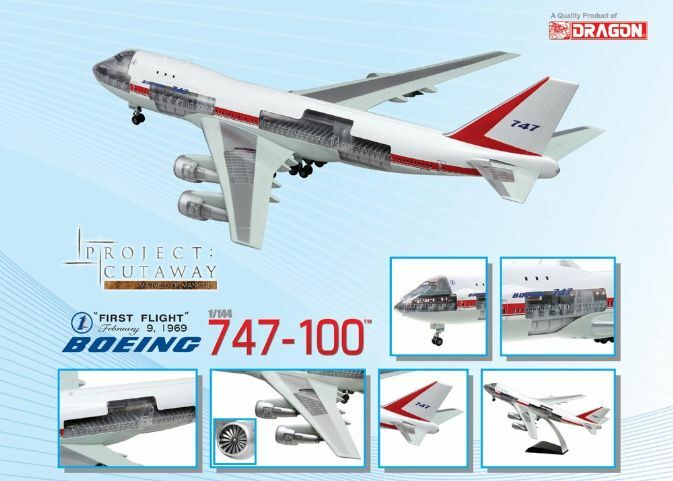 1/144 Boeing 747-100 "First Flight"
Box Size: 21.3" x 8.3" x 3"
Dragon’s innovative Project Cutaway range features this particular Boeing 747-100 aircraft that performing the maiden flight. 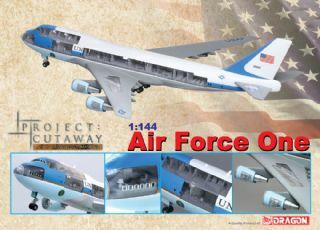 The Project Cutaway model is pre-painted and it arrives as a handful of separate parts that are easily assembled within seconds. The minimal number of cleverly engineered components results in a stunning cutaway model that exposes many internal details of the plane. The sectional nature of the model allows the seats to be seen inside the cabin, plus the cockpit, wings and engines have cutaway sections. This is an accurate 1/144 scale model, and it comes with a metal stand to turn it into a stunning desktop display piece. 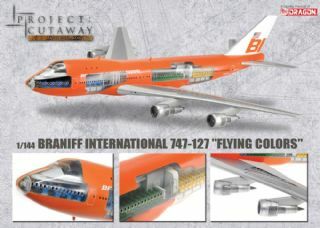 Braniff International 747-127 "Flying Colors"